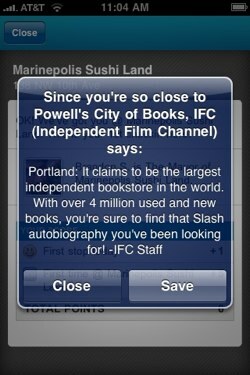 Foursquare’s new layers let organizations create lists of annotated locations that are pushed to the user. Imagine following Zagat: When you check in near a hot new restaurant, you’d get a notification. The possibilities are endless. Two partners, the Independent Film Channel (IFC) and the Huffington Post, announced the release of Foursquare location layers today. It’s a new feature from Foursquare that could turn out very cool and useful, or ravaged by disingenuous ads. The feature allows users to opt-in (meaning, it’s not on by default–you have to choose to use this feature) to the option of having a particular publisher’s locations pushed to them. If you follow IFC or HuffPo, you’ll be given notifications when you use Foursquare to check in to any location near one of their favorites. Follow IFC, and you could be told when you’re near a famous film location or a new theater. (The IFC layer is especially cool because it’s crowdsourced–this info comes both from IFC and from fellow IFC aficionados.) Follow HuffPo, and you could be told when you’re near a protest or some other news happening in real time. The possibilities are just about endless–now we can see just what all those venture capitalists like about Foursquare. I could see following Zagat for food recommendations, SFist (or Gothamist, or Shanghaiist) for local flavor, or Time Out for nightlife. Of course, you’d have to trust those organizations–it’d be very easy for a publisher to simply direct followers to a location because they’ve been paid to do so. But it’s a great use for Foursquare beyond the check-in game, and could be a real boon for anyone wandering around an unfamiliar city. Update: I should note that this isn’t a new feature–Foursquare has offered these layers for a little while now. But the partnerships with IFC and HuffPo are both very new, and could herald a new embrace of the feature.